Browsing 2018 flying events in April, the Gothenburg aeroclub’s 100th anniversary rally caught my eye. Now that would be a trip I thought, having to date only ventured abroad into France and Eire.An exchange of emails with the organisers ensued followed by evenings sitting in my study perusing route options on Sky Demon. Almost certainly this was to be one of the biggest adventures TMC has had to date having spent years Ab Initio training, but now living in pampered retirement. overfly the airport. 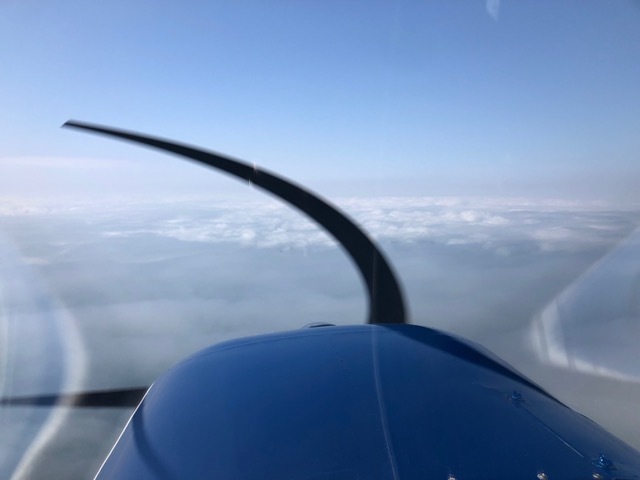 Not much later and we are above Dover Docks for the Channel crossing at 5000 ft. By now we have some cloud and lose sight of the ground but no problem we are high up in CAVOK conditions. Twenty minutes later we let down through a break in the cloud and immediately identify Calais/Dunkerque airfield ahead. Soon we are on the ground at our first of many Continental stops. 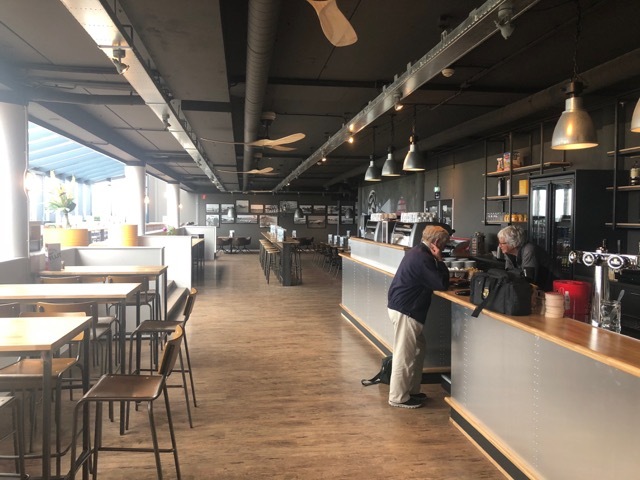 Really not much to write home about here, Calais has the essentials for the aircraft but very little for the human visitor until such time the cafe is revived. Fuel for the aircraft; yes!! Fuel/refreshment for the crew: nothing!!! We file our onward flight plan with some help from the controller in the tower, he was interested in us and seemed to put himself out on our behalf. Just three British aircraft on the ground TMC being one of them. Take off from 06 headed towards Belgian airspace. We keep low the base is still around 800 ft, the air a little bumpy. If one was to set out with a brief to design the perfect GA field they should first visit Texel. Beautifully kept grass, well marked taxi ways leading to a tarmac apron for fuel. In front of that is a large grass parking area with restaurant, control tower, hotel and superb museum all over looking the airfield. 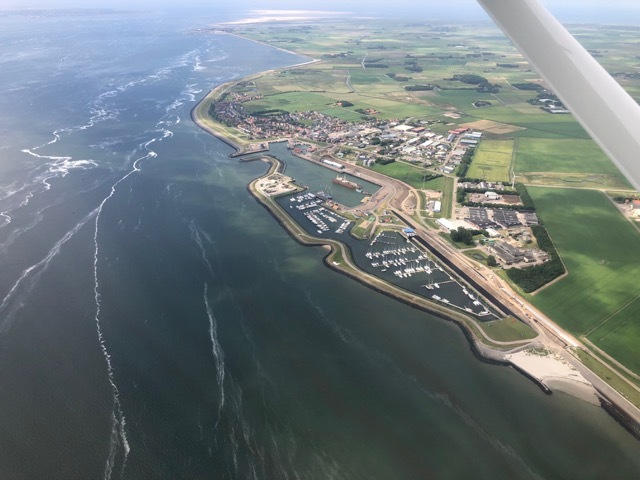 As with much of Holland Texel is FLAT…..!!! Highest point on the island is about 50 ft above sea level, unless you count the lighthouse at the North end of the island at about 150 feet !! 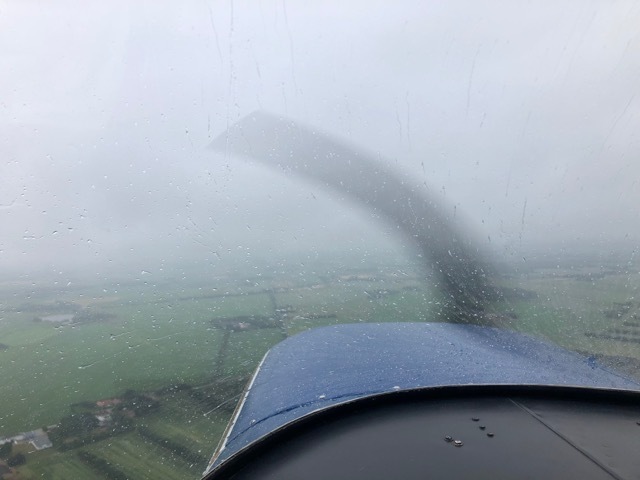 This leg took us 2 hours 50 minutes thanks to the headwind but like Calais it worked for a straight in onto Texels beautifully kept and massive grass runway. If its big enough for Sally B it would certainly accommodate a C150 with two middle aged chaps and luggage!! The short grass was completely dry as they had no rain for some weeks. We taxi in towards the tower and straight to fuel, then up the tower to meet Ed and his son Michael who run the airfield. 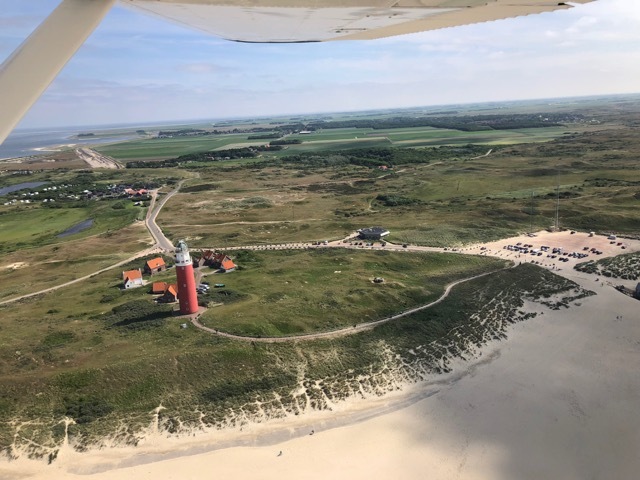 A pair of aviation professionals, Ed organises several air shows in Holland, and has one in hand at Texel on 04 August. We are given a superb welcome and In no time fixed up with accommodation in the airport hotel on site. The rooms have large patio doors and a veranda which overlook the airfield. Each room has a lounge area, cooking facilities and an immaculate bathroom. It would be possible to live in the rooms, they are virtually self contained flats. Outside there is plenty of activity with light aircraft coming and going, mainly Dutch but we did spot one UK registered RV. 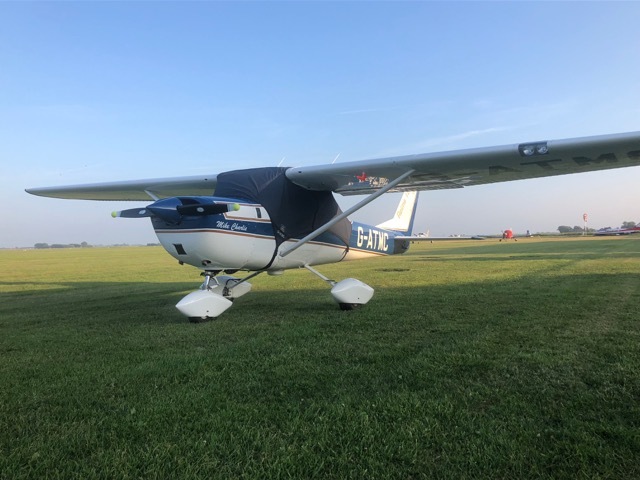 Pleasure flights are available in a couple of Cessna 172s and a very active parachute club is based on the field which uses A Cessna 208 Caravan and a pair of Cessna 206s. There are several hangars on the field which contain about 20 light aircraft including several motor gliders. A small but excellently presented museum is also based on the field, more of that anon. On the way back we catch sight of an Oyster Catcher family in a field. Mum, dad and three chicks out feeding. These birds are common on the island, the next morning another one is extracting a worm from the ground while we are doing our power checks. The bird is totally unconcerned. They seem to live in complete harmony with their metal winged cousins. We are up bright and early, another perfect day dawns. We are served with Continental breakfast by the cheery, obliging Ingrid in a temporary building beside the hotel (the cafe in the hotel is being refurbished) We soon have MC loaded and prepared for flight. A trip to the tower to check forecasts and file our flight plan. We say our farewells, and are away off the ground heading north east flying along the Friesian Islands. These low lying lands comprise mainly beaches and sand dunes with some low green fields. Holiday homes are much in evidence. Several folk were out wind surfing, a perfect day for it. We cross the border into Germany from Waddeneilanden (Dutch) to Osteriesische Inseln (German). Several of the German islands have airfields on them, almost certainly leftovers from WW2. Having followed the islands we then cross to the mainland and head towards Wilhelmshaven. I call up Wilhelmshaven, we are cleared to land and are on the ground within minutes. Beginning to get into the routine now, fuel the aircraft, clean windows, close flight plan, open new flight plan and time for a quick cup of coffee in the cafe adjacent to the airport. We also find time to check out some of the aircraft on the ground, mainly normal GA types plus a couple of biz jets. We appear to be the only G-A aircraft on the apron. Replenished we are again on our way, passing over Wilhelmshaven Docks. I speculate that I thought they were amongst the first targets to be attacked by the RAF at the start of WW2 All seems peaceful enough today !!! 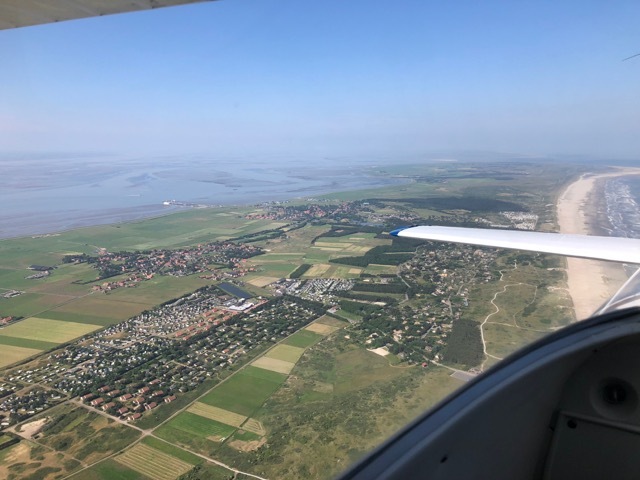 We continue flying through North Western Germany in superb visibility and catch sight of Bremerhaven, Cuxhaven, then across and over the River Elbe as we head towards Neumunster. Weather continues to be brilliant with some scattered cloud but warm and sunny. 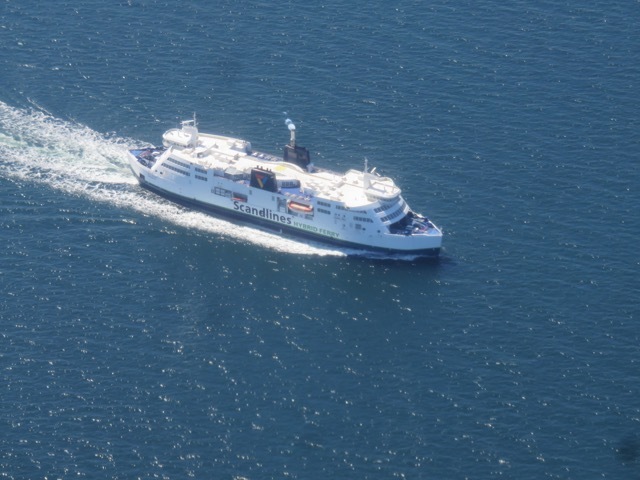 Soon we pass over the Island of Fehmarn (actually joined to Germany by a bridge) and overtake one of the ferries which makes the short crossing from Germany to Denmark (Lolland). 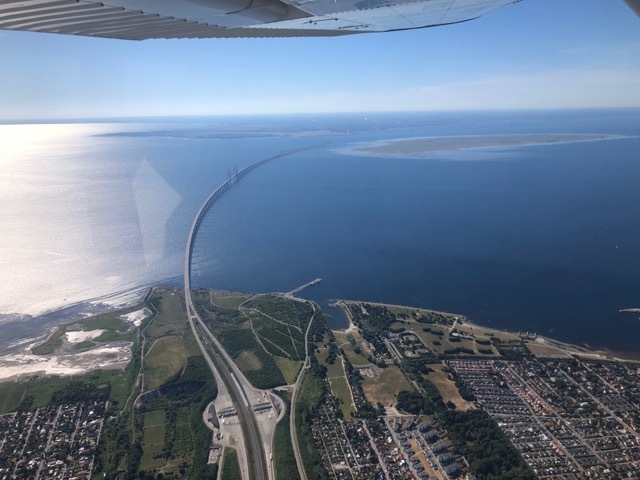 Once we have passed from German control to Danish airspace I call up Falster Lolland airport to report our presence, and enquire about the availability of fuel thanks to that pesky headwind. Control prompt reply, “Yes, we have Avgas available and ice creams ! !” We look at one another; need they say more and commence a spiral descent line up for another smooth landing. The airport is a small regional one, does not handle airline traffic but probably some bizjets. The terminal building is a modern tidy structure (typically Danish). We fuel the aircraft, complete usual formalities and enjoy an ice cream while chatting to the airport manager who has worked on North Sea helicopters. 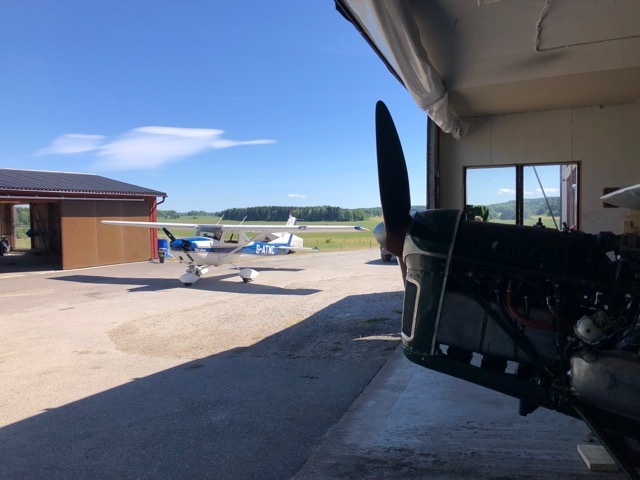 Our destination tonight is the small airfield at Trosa which is some 30 miles South of Stockholm but we still have some way to go so press on, that head wind won’t let go. The Swedish landscape is both beautiful and breathtaking especially when seen in these near perfect weather conditions. The land is heavily forested with many lakes dotted about but reassuringly we are able to pick out breaks in the forest where crops are cultivated. These of course along with deserted roads could provide an emergency landing ground should we be unlucky enough to need one. With mileage so far, time flown I calculate we cannot comfortably make Trosa with a decent fuel reserve available, so we land at Vaxjo. Guess this is probably an ex Swedish Air Force base now in use as a regional airport, but no airliners on the ground when we were there. At the far end of the apron nine Swiss Air Force PC7s were parked up, almost certainly an aerobatic team. We were parked next to a Norwegian registered Beech Kingair, our stay at Vaxjo is brief. Back in the air again, with yet more forests to admire from about 2500 feet. A beautiful evening to be flying. 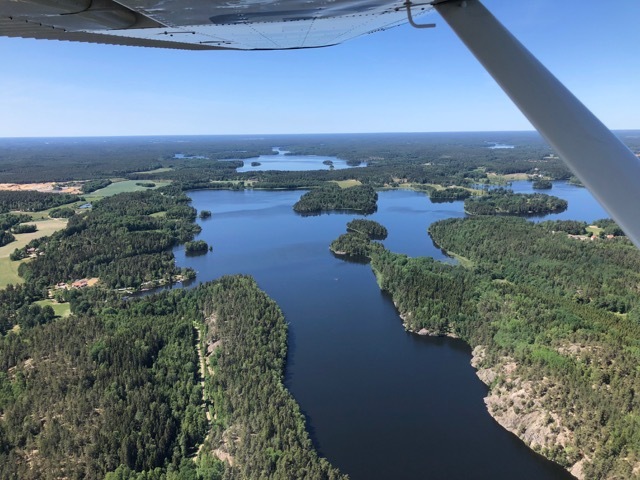 After a while the Baltic Sea appears to our right and we are navigating our way to Trosa over a myriad number of inlets, small lakes, islands and forests. The local aero club has a grass strip here which we soon have in sight. We make a call and are answered in good English, welcome to Trosa then make our finallanding of the day, another good one of course (now well into the groove and getting the hang of this flying lark) It has been a long day but we are not finished yet…..!!! As we taxi in I can see my good friend Kristian and several members of the club. With their help we have Mike Charlie tied down and secure for the night. I did manage to break off one of the tie downs, the ground was rock hard and dry after five weeks of no rain. 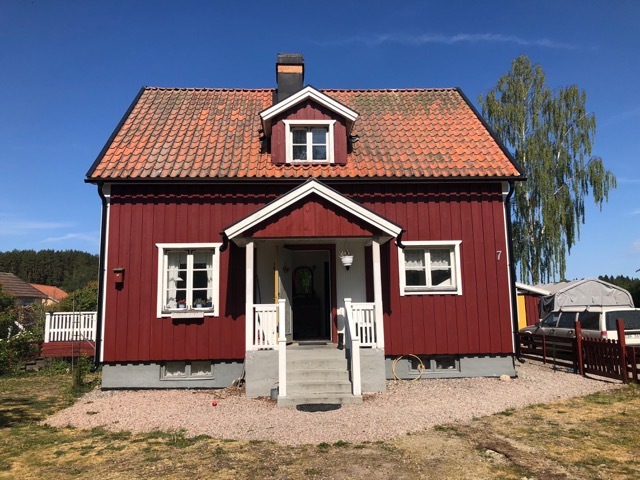 A short ride through the Swedish country side in Kristian’s motorhome and we arrive at their house. There we are greeted by Patricia, Kristian’s wife and their four brown poodles…!! speaking for myself I enjoy a restful night’s sleep. MB2 needed it, as he had not slept much the previous night and was suffering from the effects of a summer cold……ughhh!!! we stroll round to Kristian and Patricia’s where we enjoy breakfast on the patio. 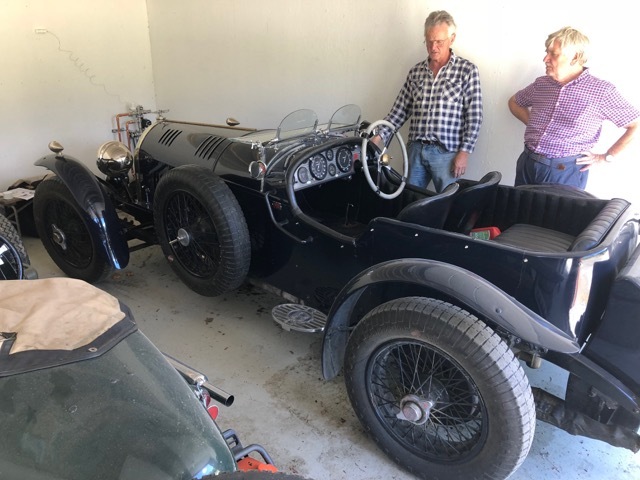 After we inspect Kristian’s workshop which contains several cars from the long defunct British Rootes group along with memorabilia including a Ginetta sports car. When did you last see one of those? We take leave of Patricia and the dogs and return to Trosa airfield where we find Mike Charlie safe and sound after a rare night parked out under the stars. 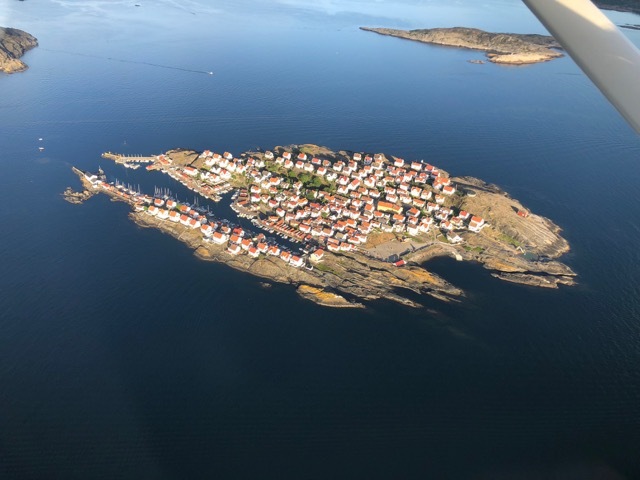 I take Kristian on a short local flight, we overfly his home and grab some great shots. Kristian remarks on how different it looks from 1500 ft AGL and also notes some new dog walking and hitherto unknown cycleing routes. 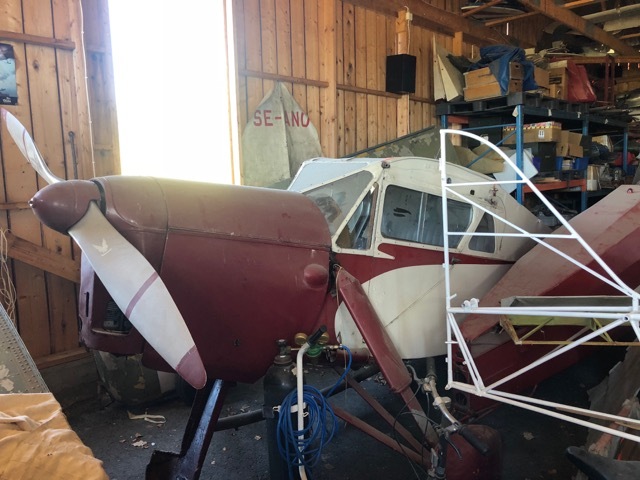 While we are flying MB2 takes the opportunity to have a wander over to the hangars where two of the locals are preparing one of the club aircraft for flight. Mike Charlie is shortly back in the circuit, then safely on the ground. We re pack the aircraft and prepare to depart Trosa after saying farewell to Kristian. A nice 6/8 knot breeze is right down the strip TMC eager to be aloft again. We clear the power lines ahead with a comfortable margin next destination is Hatunaholm. This is not marked on Sky Demon so I had checked its position on Google earth and moved the magenta line to the approximate location ( I was within a mile)!! We get on like a house on fire and are made to feel most welcome and given a conducted tour of the hangars which contain some 20 or so aircraft. Most are vintage or classics. Stars for us both are the two De Havillands a DH 80A Puss Moth SE-AFH and DH 85 Leopard Moth SE-AZM. The Puss Moth has been fully restored and has flown some 40 hours including a trip to England (direct across the North Sea !!). The aircraft is due to leave Sweden late July (in a container) bound for Australia. Plans are to fly the aircraft around Australia and then on to New Zealand. The Leopard Moth is currently dismantled having not flown for decades. It is however, complete and very authentic. We open the door and the cockpit perfume of old aeroplane, leather and oil assaults our nostrils, wonderful !!! We both wonder what the future holds for this 1930s icon. Time will tell, watch this space….as they say !!! Also present are two Klemm 35s and a Bucker Jungmann (MB2 saw these last year at the Antique Aerobatic Championships at Stauning). Tucked away in one of the hangars is an ex Swedish Air Force NA Harvard awaiting restoration. After Hakan has shown me a couple of the cars in his collection we sit down and chat over a cup of coffee. We are invited to stay the night but decline as we are on a fairly tight schedule, planning to reach Gothenburg that evening. Sweden A quest for fuel……. (beside a lake). We land at Johannesburg for fuel, but they are confused as to who has the pump key! A short flight takes us back across the lake to Hasslo which we had initially dismissed as being “too big and Commercial”. Ryanair fly in there, but in fact it works out very well. Fuel available (self service, pay on card) and we call into the aero club where as usual we are made welcome. A young lady comes out to help. Parked on the apron is an immaculate airworthy DC3 in SAS markings. We had noted it when we flew over initially. An opportunity arose to take photos of Mike Charlie in company with the DC3 two American classics. As I taxied from the pumps to position in front of the DC3 I notice a large radial engine visible through a glass panel in one of the hangar doors. In company with the young lady from the aero club we decide to go and investigate. The radial engine belongs to an FW 190! 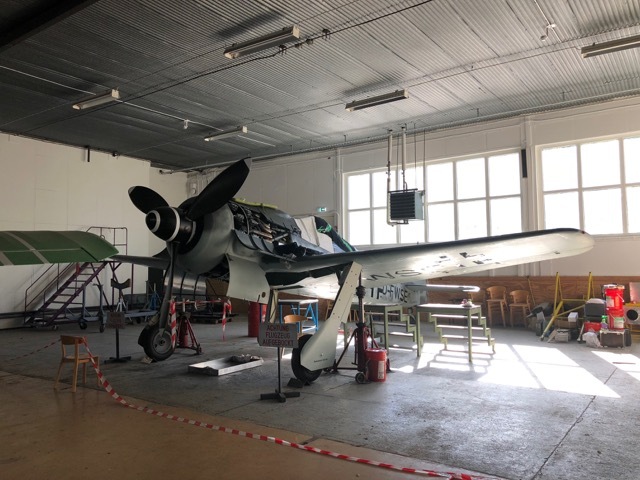 A number of these FW 190s were new built in Germany some years back using a Russian radial engine as the original BMW radials were not available. The cowling does however bear an original BMW logo………!! We admire this beast of an aircraft, it is massive alongside a Cessna 172, has a brooding and menacing presence in the hangar gloom. Photos taken and having thanked our helpful host we depart just as a Ryanair 737 lands and taxis round to the terminal. We enjoy about a two hour forty five minute flight in perfect evening weather toward Gothenburg, again marvelling at the Swedish countryside spread out in all its glory. Sweden control (equivalent of London information) look after us this whole leg, we cruise in millpond still conditions at 6500 ft, the sun still high in the air at this latitude. One of the delights of a C150 is the ability to fly along in summer with the windows open, arm nonchalantly resting on the edge. It also affords brilliant non acrylic destorted photo opportunities. One solitary call comes from Sweden control, traffic in your 11 o’clock four miles closing, we never saw it in fact that was the norm for 2+hour legs. Approaching Gothenburg from the North West we are able to identify Save airfield, just to the north of city. Save is an ex Swedish Air Force base with some hidden secrets..!! Today the airfield is used by several GA operations including coastguard helicopter and the Gothenberg Aero Club. Landing on the main runway which has a displaced threshold, the fence across the runway could do with some more distinctive markers!! We taxi in and make our way over to the Aeroseum side of the airfield where we are greeted by a number of members of the Aero Club who help us to manoeuvre Mike Charlie into a parking position. 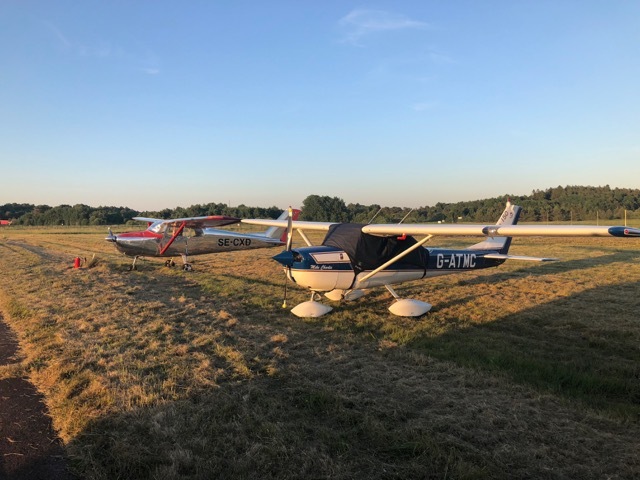 We are in good company, on one side we have a yellow Piper Cub and on the other a beautiful Swedish registered 1959 Cessna 172 in highly polished natural metal. After unloading our bags we walk over to the club marquee where we are allocated accommodation for the weekend. This turns out to be in a Portacabin crew hut on the airfield run by Aeroseum. Each room contains four bunk beds. The accommodation is basic but quite clean and secure. We are expected to provide our own towels, we don’t have any but improvise when we take a shower. MB2 had brought a smart jacket and trousers in case he needed to “scrub up” for a gala dinner or such. Wandering back to the club marquee a barbeque is in progress but both of us fancy something more substantial and a beer or two. One of the club members volunteers to run us “downtown” in a minibuse. It is by now around 22.30 but there is still light in the sky. Although there are plenty of bars we struggle to find somewhere serving food. Finally settle on an Italian cafe that provided an excellent pizza washed down with plenty of beer. Gothenburg night life is just kicking off with streets awash with youngsters and pretty girls out for the night. We hail a taxi to return to the airfield and a genial Iranian taxi driver takes us to where we thought we needed to be. After breaking into and out of the airfield we eventually find our way back to our accommodation. It is by now dark but still warm. To bed and we sleep soundly after our big day. Up and about fairly early, another glorious day’s weather is prospect. We trek across the airfield to a very good buffet breakfast in a modern hotel/conference centre. Returning to the Aeroseum side of the field things are coming to life. A few more a/c have arrived for the fly-in. The aero club have about 60 a/c booked in but inevitably there are some “no shows”. However there is plenty to interest the intrepid aviators from England. 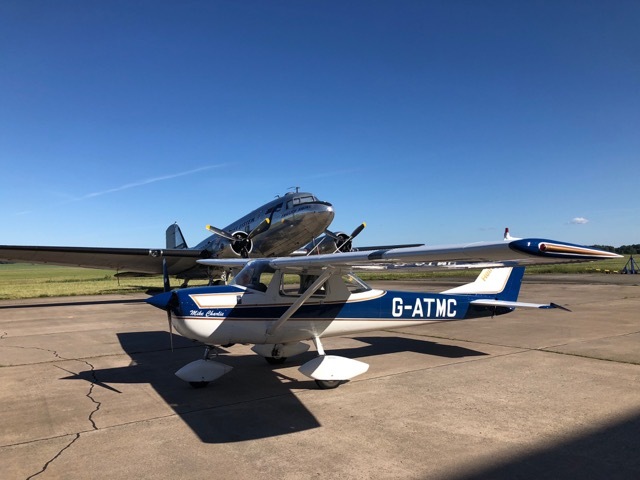 We are incidentally, the only visitors from UK so it is left to us to fly the flag for UK GA. MB2 goes off to explore, I take the chance to ensure TMC is looking her best whilst flying “G-A” flag and apply a coat of Autoglyms finest silicone wax polish. The site is beginning to buzz, the general public turning up in some numbers. The museum has promoted this as an “open day” with outdoor stalls, helicopter flights, rides on classic fire engines and in a towed non airworthy Vertol helicopter to name but a few of the attractions. Time to go underground !!!! 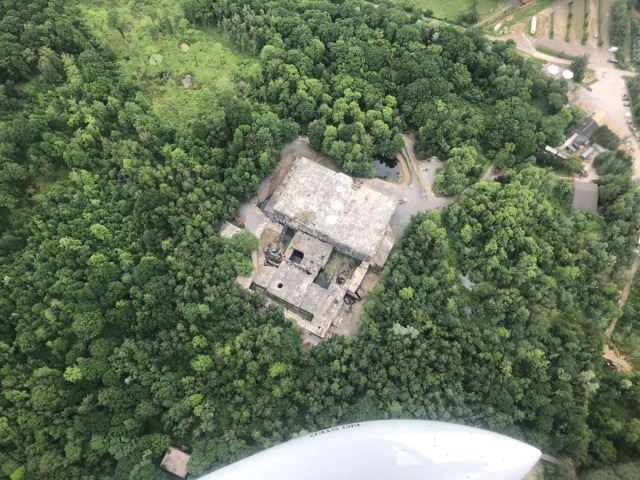 As alluded to earlier Save is an ex military base. During the Cold War the Swedish government decided to build several secure facilities which would resist nuclear attack. At Save they constructed an underground hangar complex. This comprises an area equivalent to about three and a half football pitches. The structure has been blasted out of solid granite. It took place in secrecy from 1950 to 55. ( Still can’t get my head around how they kept it secret !!) With the end of the Cold War the complex became redundant and the Swedish government disposed of the whole airfield including the bunker. Several businesses moved onto the airfield which became active as a GA airfield and the bunker was opened as an aircraft museum. Today it contains around 60 or so aircraft, mainly types that have served the Swedish military, such as Tunan, Lansen, Draken and Viggen. Helicopters are represented by Alouette II,Aluoette III, Bolkow 105, Bell 2014 “Huey”, Bell 206, Super Puma and Boeing Vertol. By late afternoon MB2 has completed his exploring and I having enjoyed a “siesta” (or the Swedish equivalent) and am beginning to show signs of flying withdrawal symptoms. Time for some more adventures. We consult the locals, they suggest a trip to Backamo, a field some 20 minutes flying time away. It is PPR, within a few minutes we have permission for a visit and we are on our way. We easily the field and land on parched brown grass to be greeted by Martin who lives alongside the airfield. Backamo Flygklubb operate two Ikarus C42s from here. Martin describes the contents of the various hangars and offers to shows the contents of another. Inside are a very smart SV4B Stampe and a Cessna Cardinal RG. The Stampe alas hasn’t flown for over four years. The owner lost is life in a Stinson 108-1 Voyager, controlled flight into terrain. I don’t know the full details but seems he was inbound on a poor weather day and collided with high ground – sobering. Martin’s wife turned up and we chat a little longer before taking our leave and head back to Save. The coastal route is chosen and we pass over some really spectacular scenery including a most impressive castle on an island, I take TMC down for close look…….!!! After about 45 mins we are back on the ground at Save as the sun slowly sinks in the west. We decide another evening in Gothenburg is in order, a club member drops us off and we are soon enjoying a beer and a meal. Another taxi ride back to the Aeroseum site, this time with a Lebanese driver, thankfully we find the correct way in and straight to bed. Most of the accommodation appears to be full, we enjoy another good night’s sleep. Sunday…… Up fairly early. Enjoy breakfast at the hotel on the far side of the airfield. After breakfast we dropped into the aero club for a look at the weather forecast and satellite images. While weather at Save is still good, over in Denmark and further south (our route home) it does not look so. In fact at one stage next Tuesday it appeared almost un flyable with a low moving in covering much of our proposed route. We start to think about revising our plans with even the possibility of a mad dash for home on Monday. We had intended to take it steady and make several calls on the way back including Stauning (with it’s top rate museum). We decide to leave and head over to Denmark with divert fields clearly noted. After bidding farewells to our hosts and thanking them for their hospitality we clamber aboard TMC. It has been a wonderful visit to Gothenburg and Save airfield with its unique museum. We knew there was an air show at Aalborg on Sunday and had planned to skirt well away as it was likely to be busy. Weather ahead was closing in, cloud base now down to 1200 ft with light drizzle and reduced forward visibility. I call Aalborg as they are the best bet for a divert, and they can fit us in but we have to circle for ten minutes awaiting our turn to land whilst Europe’s last Star fighter jet does its stuff. By now weather is not good, an ever lowering cloud base with persistent rain. Aalborg ask us if we can increase our approach speed. Throttle fully forward we show 95 MPH and shortly the welcoming site of runway lighting emerges from the gloom. Aalborg is Denmark’s second airport opened in 1938 it was originally a military field but is now used extensively for airline traffic both scheduled and charter. The main runway 08L/26R is just short of 9000 ft!! We land on the slightly shorter parallel 26L which is slightly shorter. We see some of the air show activity on the far side of the field but we are directed to the GA apron which is opposite to the main terminal building. Transport arrives to take us to the terminal where we spend some time checking forecasts and planning our next move. The onward forecast leaves us wondering if we might end up spending the night here!! Chatting to several other GA pilots, including a Norwegian trying to head for home in a smart Cessna Cardinal. I look outside periodically willing the weather to improve and glimpse a Catalina flying boat flying low level in the rain and gloom. There appears to be some confusion as to when we can leave. After tea and coffee around three hours later we receive clearance and are able to depart at five o’clock. At one point we nearly end up facing an oncoming airliner who is told to hold, as we have taxiway priority!! We continue to taxi out and hold alongside a Mirage fighter. It commences its take off roll throwing up a massive cloud of spray from the soaked runway, raw engine thrust penetrating our cabin from such close proximity. Lining up we advance the throttle opening our flight plan once airborne. Climbing away the plan is to make Wilhelmshaven later that evening after heading south down over Denmark. The weather is actually better then forecast and improves each mile as we cruise along. I climb to around 4500ft above scattered clouds, we spend around an hour and half flying along in glorious sunshine. All necessary clearances are obtained without fuss the flight proceeds smoothly. After this memorable leg it is soon time to think about making our way down and landing at our destination Wilhelmshaven. We call them up and receive clearance to land spending around three minutes in a solid IMC decent. I subsequently find out the field is PPR after 16:30 on a Sunday, by chance one the staff from the tower (Christian) had picked us up on his home hand held radio and came down to the airfield to meet us and switch on the landing lights as dusk drew close. Formalities completed, Mike Charlie safely parked up, Christian fixes us a taxi and two rooms in Hotel “Home” in Wilhelmshaven. We check in, drop bags and enquire about somewhere to eat. Directed to a Greek restaurant about 70 metres up the street we are well received. I think we were the only customers and are served a tasty meal (MB2 has Moussaka) Again we enjoy a beer, both of us ring home and let respective “nearest and dearest’s” know we are safe and well and headed back. Shortly we adjourn to soft and welcoming beds……………. The pressure is off as the forecast has improved and we decide to return to Texel. We liked the place so much we felt we had to return and a good reason to visit the museum. I could also return the iPad charging lead I borrowed when we first arrived and by habit and error packed it away with my iPad. We take a more inland track than when we flew up on Thursday, it gives us a change of scenery and passes by some interesting places on route. 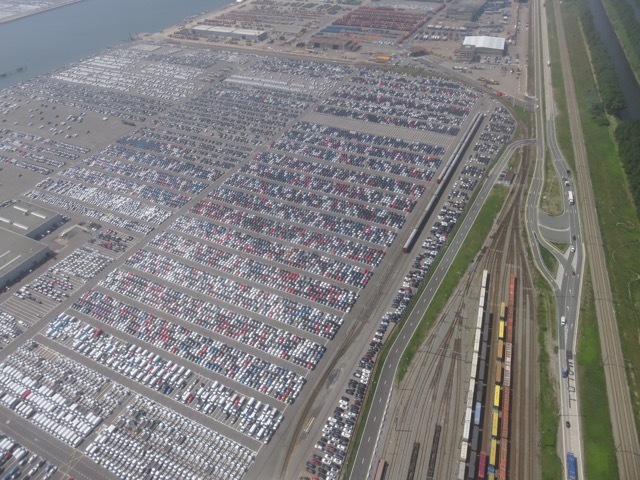 Over Emden we spot thousands of white vans neatly parked. Emden is home to Ford’s European production unit for the Transit van. Later we cross the Ijsselmeer parallel with the A7 motorway complete with its service area surrounded by the the sea. Germans who put down concrete, since removed, back to grass!! Is that called progress?!! The museum contains several full size aircraft, mainly homebuilts. Also notable are several excellent dioramas. end of the island then return to base. A sailing clipper is seen below and riders out exercising horses on the miles of sandy beaches. That evening we enjoy another great meal at the adjacent hotel. The last hand to hand fighting in WW2 Europe took place on Texel. The German military had a large enforced Georgian garrison stationed on the island. As soon as they were aware the war was over they took matters into their own hands and took on the Germans with bloody hand to hand battles, routing out any nazi sympathisers they could find. Locals assisted, but retribution from the surviving Germans for those captured was swift and brutal. prior to the short Channel crossing. Originally I intended to use le Touquet for MB2’s benefit having never visited, but the forecast weather prevented this so we will stop at ever helpful Calais. On our way we transit over Belgium. 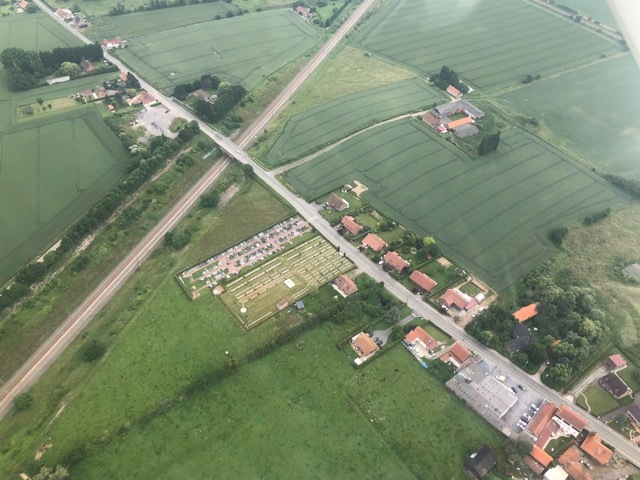 A lot of the area flown over was occupied by WWI trenches, now, of course mainly returned to agricultural use but it is easy to pick out CWGC cemeteries. These vary in size but are quite distinctive and very poignant to the observer from above, the scale and size in some cases difficult to comprehend. Another landmark we pick out is the “Eperlecques Blockhouse”. This massive concrete structure was built by the Germans to launch V1 & V2 weapons. On one side we could see an inert V1 sitting on a launch ramp pointing ominously towards London! Weather was starting to deteriorate as we track north, crossing the Thames estuary working Southend radar the cloud base getting lower. I am not happy, rising terrain ahead focuses me more then any time on this trip. I call for a weather diversion into Southend and am immediately granted clearance to join left base to land. 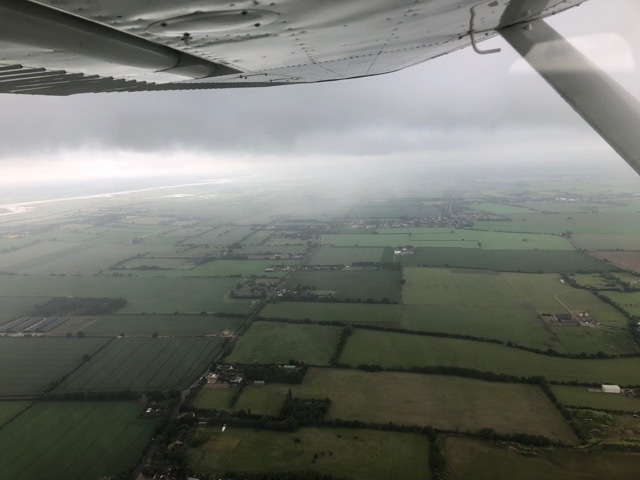 Soon after receiving clearance we pass though a curtain of low cloud and rain, and suddenly like a curtain being opened the sky over Essex is much clearer. I cancel the divert and we proceed towards Elmsett. Wattisaham oblige with a squawk and we make our final landing of the trip on 05 slightly uphill in broken sunshine. The Special Branch and Border Force are NOT there to greet us. I had received a text earlier intimating out GAR formalities were not in order!! A phone call from home reassured them, by then my email from Texel had appeared at Norwich. Next time we will take a carrier pigeon as a final communication resort!! Mike Charlie was off loaded of luggage etc and put safely away in the hangar. She looked oil streaked and had lost her polished shine not surprising given the distance and and hours flown. Hangar doors closed we drive back to my home dropping off borrowed life jackets at the office of the airfield owner. Two items we certainly did not need but would have been unwise to proceed without them given the amount of water crossed. Review of the whole trip !!! A big thank you MB2, my very good friend for accompanying and putting his faith in my ability to navigate and deliver him safely back home and for sharing this great adventure. 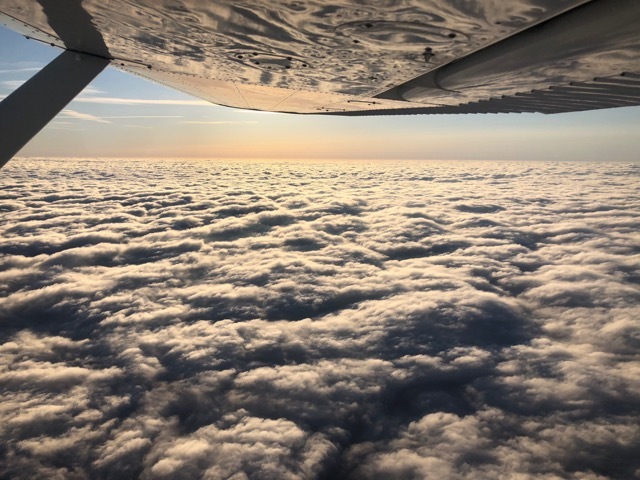 We completed just over thirty two hours flying in a fifty two year old Cessna 150 in seven days. 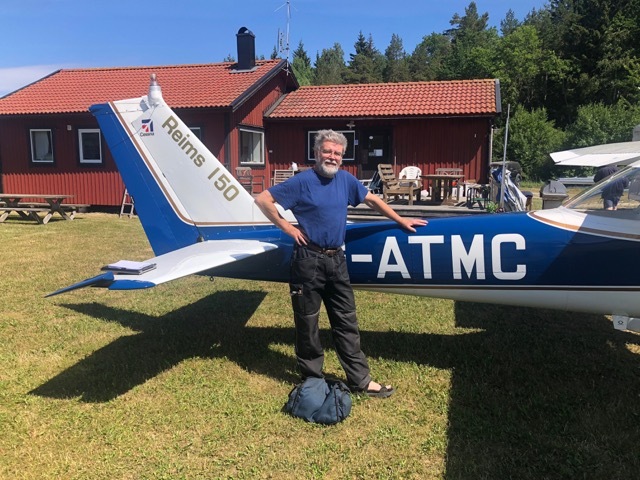 Although the 150 is not really a touring aeroplane we achieved our objective of attending the Gothenburg Aero Club 100th anniversary fly-in, enjoying some wonderful experiences along the way. We met some great people, virtually everyone was helpful in one way or another. away was memorable, as was the countryside and total lack of traffic. And we only saw some of the south of the country. The trip gave us both a new perspective on air travel in Europe. I found the trip instructive and educational on many levels. My first serious long distance flight P1 in a light aircraft. 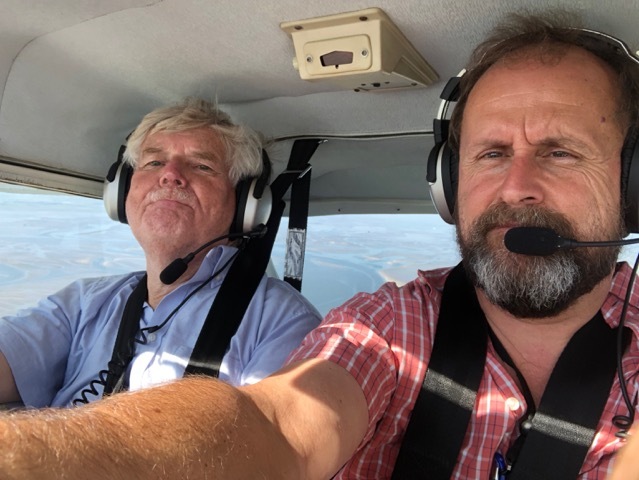 It gave me the opportunity to reflect on achievement of the aviation pioneers who flew with much less reliable aircraft (well done Mike Charlie !!) and certainly much less sophisticated navigational aids. In many ways the airways have become more restricted with more controlled air space etc but in some ways this has been compensated for by modern navigational aids such as Sky Demon. What should we have taken ??! A towel, and extra knee pad for MB2 to jot frequencies etc down and an atlas of Europe !! What should we not have taken ??!! A smart jacket and smart trousers, oh and a tie !!! In summary around 3000 miles flown in almost perfect conditions. TMC performed flawlessly, never missed a beat and was much admired by all who saw her. She went through 10000 hours airframe time from new and burnt around 18 litres per hour (4.5 GPH)The engine consumed one litre of oil, the longest leg we flew was 3 hours 15 minutes.